Did you ever wish you lived in a world filled with people with passion about what they do, with a dedication that often surpasses the logical mind and showing perseverance for almost a decade? I know I would, because the world would definitely be a better place. 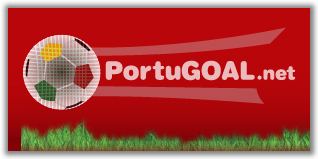 PortuGOAL, one of the sites this blog contributes to, is proposing a wonderful idea to its readers: Tom Kundert (the site's owner, so to speak) and Ben Shave (his right arm and gifted journalist) will write a summary of the 2012/13 Portuguese league in a very appealing A4 book with 120 pages, including 50 photographs. The idea behind this project is not to make money for the authors, but rather to help to support the cause and hopefully revamp the site, so it's more user-friendly. There are no kind enough words to talk about Tom. His dedication to the idea of informing the world about Portuguese football in English has been of great service to many - particularly second- and third-generation Americans of Portuguese descent. Also, Zonal Marking's own Michael Cox, one of the leading references in the footballing world, has admitted publicly he uses PortuGOAL to keep up with Portuguese football. There are literally thousands of people that read PortuGOAL. I was one of them and I was fortunate enough to be included in this absolutely amazing team, sharing everything I know to help Tom and all the other hard-working fellows in trying to offer the best contents we can. Neither one of us makes a cent while writing for PortuGOAL. Neither Tom and Ben are writing the book to capitalise on anything - except maybe the fact that it would be great to have a PortuGOAL book in our hands. All of this comes from our heart and soul. We just want to do the best job we can and offer one heck of a site to you, the readers. For this pitch to be successful, we must have 400 people buying the book. I've just done my part and bought my copy for myself, because I would like everyone to know that this is indeed a cause I truly believe in. I can only hope many of you will do the same (and some have already done it) - because I really think this site deserves it and because I promise to post a photo of Tom with a huge smile on his face if we do get to 400 contributors.